Cobra Kites Info. Why shop with us. We stock an impressive selection of kites for every interest, skill level and budget. From family and kid friendly kites, to massive show kites. Stunt Kites, Power Kites and ram-air steerables, Cobra Kites has those too! Cobra Kites is owned and operated by Jeanne and Ray Merry. They are both very passionate about the many facets of kiting and have a long history in the kiting industry. Their diverse experience includes not only designing kites, but all phases of manufacturing, wholesaling and retail sales. On-line and in a brick and mortar kite specialty store. Their roots in custom and design work began in the early 70's. Their work has included the patented FlexiFoil®, SkyTigers, Scorpion, Speed Sailing records, studio design work, custom corporate installations, advertising and show kites. You may have seen their work in films or advertisements and not even realized it. 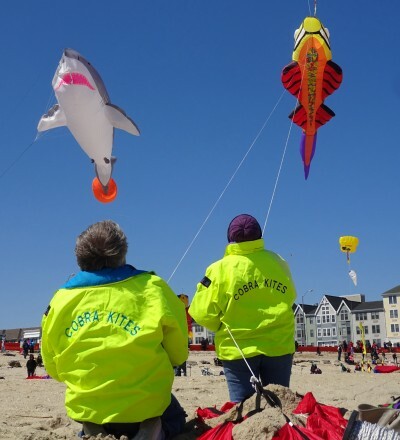 Cobra Kites operated a kite specialty retail store in Toms River, NJ for 18 years. During that time, they also organized and ran 'Cobra Kites Wednesday Kite Nite' on the beach in Seaside Park, NJ. A well attended weekly Summer kite fly with thousands gathering to watch and fly kites. Quite a spectacle. You are likely to spot them often flying along the Jersey Shore beaches. They may be testing a new design or prototype, or just enjoying their love of flying kites with friends. Need more information or still uncertain about what kite is right for you? They will be happy to guide you through your best options, offering tips along the way.